This application presents the 12-metre-long Japanese Kidai Shôran picture scroll from the early 19th century. 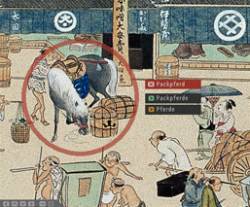 The unique work illustrates the most important trading street of Edo, modern-day Tokyo, around the year 1805. Featuring upwards of 1,000 figures, 40 different shops and hundreds of houses, the brightly coloured scroll is testimony to the rich tapestry of life in the Japan of the early 1800s. The presentation gives visitors the opportunity to interact with the past and experience the multifarious content of the original. It offers visual and textual information on many aspects of life at the time including religion, customs, fashion. Five guided tour's through the picture make the hand scroll accessible from various perspective. Visitors can choose from a variety of access modes: they can select the explorative route to information or the audiovisual presentation of successive sections of the Kidai Shôran. Alternatively they may choose to carry out focused research for precise information and key terms.